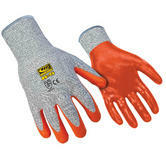 In this category you can find a wide range of impact resistant gloves developed by Ringers. 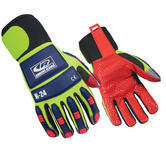 Ringers are Texan impact protection gloves built with attitude. Since 1996 they have being going against the norm, driven by the belief that conventional gloves are not fit for purpose. This has driven Ringers to invent and design the best dorsal impact gloves on the market (the Rolls Royce of impact gloves); and to use advanced Palm Grip technology; and high visibility ? to enhance situational awareness. All gloves are manufactured from the highest quality materials that ensure a long lasting product with exceptional comfort and durability. 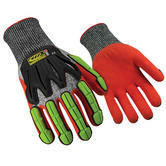 The Tefloc 267-10 glove is one our best sellers. This glove is a prime example of what Ringers has to offer. 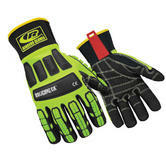 Manufactured with protective TPR areas on the back of each hand to protect against impacts. The palm on each hand is textured for improved grip. 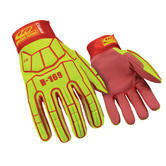 Ringers gloves are primarily known for impact protection. But they have excellent dexterity and grip, while the Abrasion, Cut, Tear and Puncture resistance is also strong.